However, my wife declared it to be so bad as to be embarrassing. Instead I persevered and took a number of shots of a gift-wrap bag made from iridescent paper, lighting it from the side with an angle-poise lamp. I liked this particular shot because it looked both decrepit and vibrant at the same time. I didn't use Photoshop, but I did use Apple's Aperture 2 to adjust the black point; increase the exposure; change the white balance; de-emphasise the greens and emphasise the blues. Now I'll sit back and see if I come last or not.... and for the record, the wife thinks this one is dreadful too. I think one person guessed correctly during the challenge; many people pulled me up for a lack of focus and I do agree it looks blurred - however, I think the surface probably is a bit more in focus than it might appear - if you look you can see the scratches across the paper. I had set myself a mental target of of 4.5 and I'm actually really pleased with a 4.7 - for some people to like it as much as they did is a surprise to me - thanks. I like the brigth discos, they blow up. A stumper, so meets the challenge. The idea and comp are interesting. Overall, there appears to be nothing in focus. You may have intended that, but it leaves no place for my eye to rest. At first glance they look like unsharpened pencils but there are the areas taht are glowing. So that can't be. so I am think holey cork board with lights in the background. Very interesting shot. haha! thats a cool idea. Isnt that the stuff that you turn it different ways in the light it turns different colors? Ooh. Interesting. No idea, though. 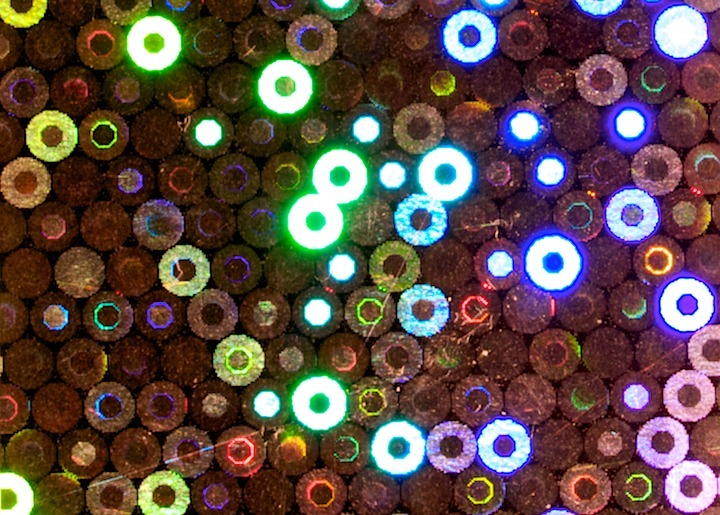 I think this is sequins. Maybe. I would think they would have some thread on them. Could be nail heads, but the colored centers don't look right and I don't think nails would reflect that sort of disco lighting. I see a lot of reg green and blue. Pixels on a CRT monitor or TV screen? Macro is always tricky making sure the focus (DOF) is spot on. I have a hard time finding focus in this shot. Looks like a stack of coloured pencils but I don't know how you got some of them to shine like that. It is very difficult to photograph flat reflective objects like glitter. (I'm guessing). Are these sequins? I wish it were more in focus. Proudly hosted by Sargasso Networks. Current Server Time: 04/22/2019 02:13:13 AM EDT.